I stood outside a dark brown, wooden doorway. As I turned the knob and the door partially opened, I saw a huge pile of coins on the floor, glowing with a green light. Pushing the door open, I stepped through the doorway and stood in a large room. I could see the outlines of the walls but they were indistinct and darkened. All I could really focus on was this pile of coins…just the pile of coins laying in the center of the room. Taking a step forward toward this pile it suddenly grew, exponentially! Whereas before I had been looking down at the pile of coins, instantly I was looking UP AT this huge heap of glowing coins, now taller than me. It had grown so incredibly quickly, with literally no warning as I took a step toward it. I realized in that moment that the Lord is setting us up for revival. Somehow, I knew that the coins are resources: wisdom, peace … a strategy. “Yes, Lord! A Strategy!” I cried out. Then the walls faded from darkness into an old-fashioned room. I could see the wallpaper and a large, white fireplace. I knew somehow that the fireplace was the only source of heat and light in this room. Next to the pile was a family, kneeling, side by side, gazing upon the pile of coins; however, their pile was much smaller, not the giant heap of coins that I had seen earlier. I know the rest of the family is there, but the father is the focus. He wore a white, curled wig with a ponytail, such as one would wear in colonial days. I knew now that this is during the revolution – the revolutionary war. The Lord is bringing a revolution — to His world, His family, His revival! As I looked upon the father’s face, it was glowing from the reflection of the coins. He was smiling sweetly with utter contentedness and total satisfaction as he gazed upon the coins. That hit me so deeply in my spirit! Of course! Yes, we all want to be by the fire! In the natural, we gravitate to the fireplace when it is lit; we gather around a bonfire or a campfire. We long for, are attracted to and gather around the supernatural revival fire of the Holy Spirit, too! He didn’t answer immediately, but just moments later, as soon as I turned on some worship tunes, a song came on that I had never heard. As I stood for a moment to listen to the lyrics. It was about fire, joy and testifying! I smiled as I realized the Lord had answered my plea. The strategy is to ignite the fire within with joy, the joy of the Lord, spread by the word of our testimony! YES, LORD! We overcome with our testimony (see Revelation 12:11)! The right testimony at the right moment can be the catalyst – the SPARK – that ignites the raging inferno revival fire! This ties right into what the Lord has me doing in this season. I am gathering “Breakthrough Bytes” from anyone who has experienced breakthrough in any area of his or her life. These are short video testimonies of breakthrough – and ANY testimony is a breakthrough! The goal is to broadcast these short video clips about breakthrough throughout the day online and on social media to encourage the body of Christ. This plan of God could help to ignite the fire of revival! The Lord speaks in so many ways, but it is His heart to gather us around THE Fire – HIS Fire! – the Fire of His Holy Spirit. We have seen some revival, a little here, a little there…but I believe that the Lord would have us SUDDENLY, EXPONENTIALLY walk into an explosion of His Revival Fire, combust and burn with Holy Ghost flames! 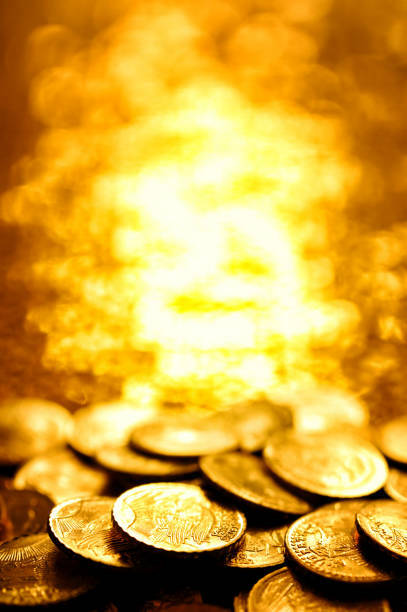 I believe, just as the pile of coins suddenly, exponentially increased in size, we will do the same with our resources for revival – peace, wisdom and strategies! Our testimonies will encourage and convince, evangelize and give hope, providing peace and comfort in the God that is no respecter of persons (see Acts 10:34). After all, if He’ll do it for me, He’ll do it for you! Let’s shout it out! Get out your megaphones and shout out about the goodness of God through your testimonies! Ignite the fire within! Ignite the Revival Flame, with joy and the word of your testimony. Many, many blessings in this season of revival! Previous Previous post: Do Not Be Condemned!